Two years after passage of the revised Violence Against Women Act (VAWA), tribal courts have finally been granted authority over the investigation and prosecution of non-Natives charged with domestic violence on reservations. VAWA, originally passed in 1994, aims to address violent crimes against women by dedicating federal dollars to the investigation and prosecution of criminals who perpetuate violent acts against women. When the act was reauthorized in 2013 despite staunch opposition from some members of the Republican Party, a component of the law launched a pilot program that finally vested members of the 556 federally recognized tribes to criminally prosecute outside members. Before now, non-Natives who committed crimes of domestic violence or violated protection orders against tribal victims on reservations were held under the jurisdiction of federal or state law enforcement. This posed many issues, as these entities tend to function far from tribal land and lack resources necessary to address such issues head on and have been known to have an insufficient understanding of Native life. Also, because of the complicated conviction process, perpetrators often escaped prosecution, leaving the victims feeling doubly betrayed and powerless. 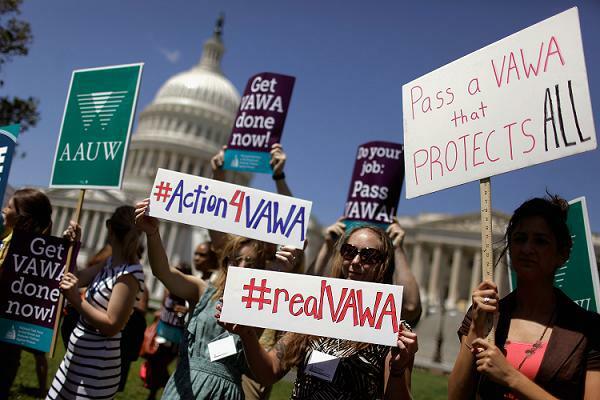 The VAWA reauthorization didn’t come easy. House Republicans came close to knocking down the bill in 2013. Vice President Joe Biden, original Senate sponsor of the bill’s 1994 version, negotiated with House Majority Leader Eric Cantor (R-VA) in order to push through and finally pass the revision with backing from most Democrats. Now, tribal law enforcement carries the power to handle these pertinent cases. “This is a major step forward to protect the safety of Native people, and we thank all members of Congress for passing the Violence Against Women Act of 2013 and recognizing tribal authority,” said president of the National Congress of Indians, Brian Cladoosby. Native American women face some of the nation’s highest rates of sexual assault. Three out of five have been assaulted in their lifetime and 59 percent of the assaults take place at or near private residences, says the National Congress of American Indians. As part of VAWA’s 2014 pilot project, three tribes adopted the new measures. The Confederated Tribes of the Umatilla Indian Reservation, the Pascua Yaqui Tribe, and the Tulalip Tribes, were approved by the U.S. Attorney General after submitting detailed procedural plans. As of now, they’ve charged 26 offenders under the revamped bill. Any proposed means of lessening the shocking rate of violence against Native women is worth consideration. The fact that this major resolution has reached a point of action is incredibly exciting. The law is one more step toward righting historical wrongs and is a common sense approach that allows Natives, and particularly female Natives, recourse to the justice system. As of Saturday, March 7, tribes may opt-in to the program. Such good work you are doing. Thank you.